It was a last minute trip. Oh, how I hate these last minute trips! You always get high fares and you don't get the timings you want. And you invariably forget something. Honestly, I am quite a fussy guy. I need my stuff around me and feel quite lost without some of my things. Anyway, I did not have a choice. The meeting had to happen. So, within a few hours of crystallizing the plan in my head, I found myself in a cab driven by an oblivious cabbie on the way to the Shamshabad Airport en route to Chennai. I find that people have extreme feelings for Chennai. Some love the city to the core. I know people who willingly give up high paying jobs just so they can settle down in Chennai. They simply swear by the city! And then there are the rest of them. They loathe the city. Everything about it. The food, the people, the place. I am neutral. I have no problems with the people or the place. I love the food here (more about this in a bit). I was warned about the airport even though this was not the first time I had been there. I was told that a whole swarm of taxi drivers would accost me and ask me to take their taxi. No such thing happened because I took a pre-paid taxi. I guess it is an unfair bias after all. I reached my hotel at around 12 noon and checked in. I had a meeting scheduled at 1:30. That gave me enough time for lunch. I checked with the room boy where I could get a decent South Indian Thali. He told me to go to the Malgudi restaurant on the Ground Floor. I went there with high expectations. This was Chennai after all - the best place for a South Indian Thali. I asked for the menu. This turned out to be a branch of the Malgudi restaurant at Hyderabad - only much pricier. Disappointing! I looked for the Thali. All I got was some platters. Guess how much they were priced at? The cheapest was Rs. 1,300! WTF??? Thirteen hundred bucks for a thali? I decided to go for a dosa with some Karnataka-origin curry (I forget the name). The dosa was good. I took one spoon of the curry and left the rest. The bill came to Rs. 641 - for a dosa and one spoon of curry! Many people in Andhra Pradesh are used to a variant of the idli rather than the idli itself. Most hotels do not use rice while making the idlis. They use rava. This makes good idlis too but the original is something else. In Chennai and the entire state of Tamil Nadu, the rice idli is the default. There is a difference. The rice idli, though a bit heavier to feel, is much lighter and better to taste. When I come to Chennai, I always make it a point to visit the Murugan Idli Shop. They started off with one outlet in T Nagar, close to Vani Mahal and have now expanded to 15 outlets including 2 in Singapore! They serve out-of-the-world rice idlis. The other fare is also good. I was told not to miss the uttapam. I tried it. Good. But not as good as the idlis. The important thing to know is what the best thing about a place is and then focus only on that. When I go to Poorna Tiffins in Hyderabad, I only eat idlis. Nothing else. So (I must) let it be with Murugan. On an interesting note, a relative of mine, also an idli aficionado, suggested I try the Idli Vilas, a new joint opened right outside Savera Hotel, where I was staying. 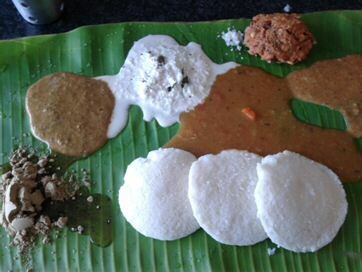 I kept space for a plate of idli and checked Idli Vilas on my way back from Murugan. The idli was good. But not as good as Murugan. All in all, it was a great trip. Thanks in no small measure to the idlis! Hey Kamal, that was a very interesting travel account and looks like you had a lot of action on your trip. Keep travelling and do share your experiences with us.